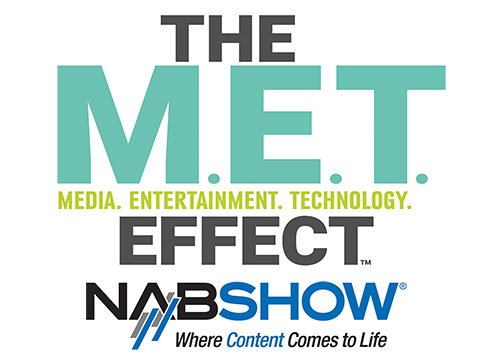 As part of our in-depth coverage of the 2018 NAB Show, Digital Imaging Reporter presents the 2018 NAB Product Showcase. It includes some of the latest notable equipment for multimedia content creators and filmmakers. 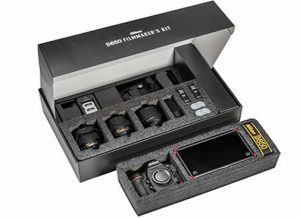 The Nikon D850 Filmmaker’s Kit is a custom bundle for content creators and filmmakers looking to take advantage of the multimedia D850’s video capabilities and controls. Its key component is the D850 DSLR, with advanced features like full-frame, 4K UHD video capture at 24/30 fps; 8K/4K time-lapse recording; focus peaking; zebra stripes; HDMI output; and also audio level control. 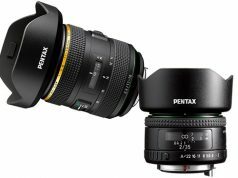 The kit additionally includes three Nikkor f/1.8 prime lenses said to “exhibit the clarity and sharpness needed for 4K Ultra HD video”: the AF-S Nikkor 20mm f/1.8G ED; AF-S Nikkor 35mm f/1.8G ED; and AF-S Nikkor 85mm f/1.8G. 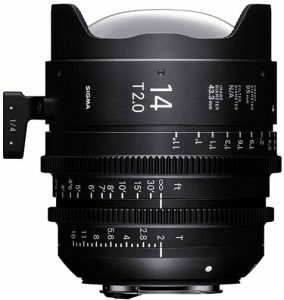 Sigma is presenting its cinema lens line. Answering the demand for creating distinctive cinematic looks, Sigma Cine lenses are engineered to deliver color as well as focus consistency. “The versatility of the lenses combined with the superb optics will serve any production from the single run-and-gun DSLR setup to a full-frame multi-camera set,” said Mark Amir-Hamzeh, president, Sigma Corp. of America. Designed with input from cinematographers, Cine lenses support PL, E and also EF cameras. 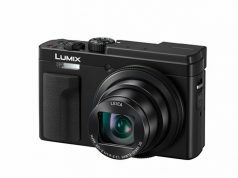 Features include: 8K-resolution support; standardized gear positions and filter sizes; a 180° focus rotational angle; a 160° zoom rotational angle; a 60° linear iris ring with full manual control; splashproof construction; and EF/E mount interchangeability. 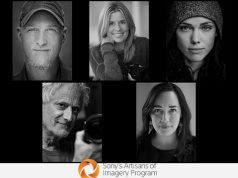 Moreover, their low aperture light capture capabilities let DPs/camera operators shoot at a shallower depth of field with more latitude for how they light a scene. The HVL-F60RM α system flash offers integrated radio control options as well as a guide number of 60. It covers illumination angles from 20–200mm for uniform wide-range coverage without shading with continuous shooting of 220v flashes. Its recycle time was also reduced to 1.7 seconds or 0.6 second with its external battery adapter. 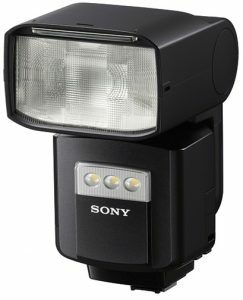 It adopts Sony’s Quick Shift Bounce technology: photographers can quickly shift from horizontal to vertical orientation, 90º left or right, upward by up to 150º and downward by 8º for flexible positioning and optimum lighting. In addition other features include: independent light output level buttons to control output/compensation; its display facilitates adjustments/flash output level confirmation, with access to flash settings for paired wireless flashes; flash functions can be assigned to its four-way controller, center button and control wheel; TTL flash output can be recalled in manual mode; and moisture resistance. Zylight is showing its full catalog of lighting solutions, as well as products it exclusively distributes throughout North America. Products include Aladdin flexible panels, Rayzr 7 high-output Fresnels, NanGuang RGB fixtures and Fresnels, and also FXLion portable power solutions. 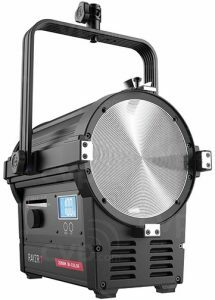 Rayzr 7 is the latest in a select group of broadcast, film as well as stage lighting manufacturers that Zylight distributes. The series includes four models of Fresnel LED lights: the 300 (300W, $1,339) and 200 (200W, $989) Daylight Fresnels; and the 300B (150W tungsten/daylight, $1,599) and 200BM (100W tungsten/daylight, $1,259) Bi-Color models. Distributed in the U.S. by Manios Digital & Film, Cartoni is introducing additions to its professional camera supports. 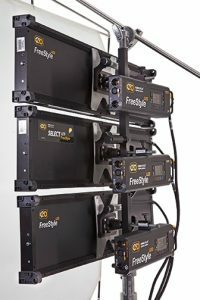 The company’s fluid heads, tripods, pedestals and remote devices are designed to address critical needs of broadcasters, rental houses as well as camera operators. 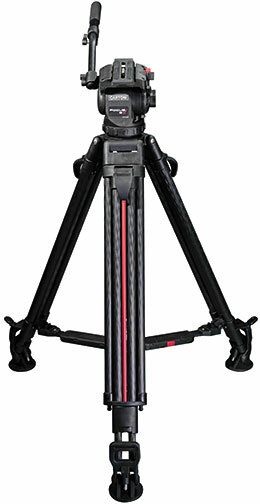 Cartoni’s 75mm base SDS (smart deployment series) tripod and spreader support system is for ultra-lightweight cameras. 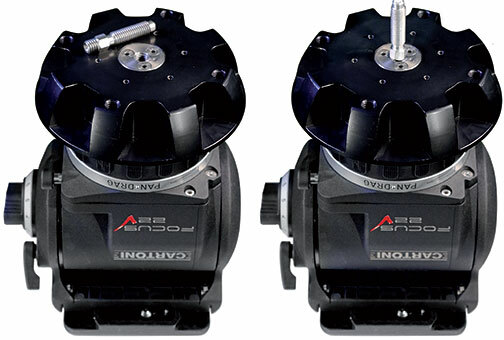 It combines the company’s Focus 8 fluid head with a new SDS version featuring Cartoni’s Smart Stop two-stage/single-lever tripod and Smart Lock mid-level spreader technologies. Available in aluminum and carbon fiber, it quickly spreads and collapses for on-the-go shooting. In addition, the Focus 8 handles payloads up to 17.7 pounds. It uses a continuously variable fluid damping system on pan-and-tilt movements and also Cartoni’s patented variable counterbalance. 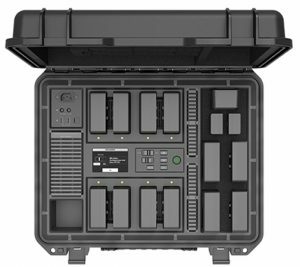 The DJI Battery Station is designed for professionals seeking advanced battery management to handle any shooting scenario. Built for the TB50 intelligent battery, it is an all-in-one solution for charging, storage as well as transportation for professional film crews. Compatible with products like the Ronin 2, Inspire 2 and also M200 drones, it’s a reflection of DJI’s commitment to professional cinema. The station stores 12 TB50 intelligent batteries and charges eight simultaneously. Moreover, multiple ports let users charge other devices, including remote controllers, WB37 batteries and mobile devices. An LCD screen displays the power level, charging voltage, remaining time, temperature and also firmware version. A built-in cooling fan helps dissipate heat while charging, and there’s an integrated overheating detection monitor. Tiffen, manufacturer of accessories for the consumer/professional imaging and the motion picture and broadcast television industries, is showcasing Steadicam stabilizers. On exhibit is the recently launched Steadicam Air. 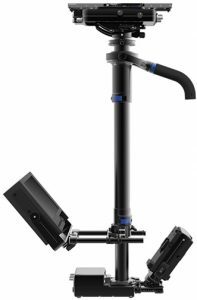 The monopod is gas-lift activated by a foot pedal for adjustable height. Designed in partnership with master cinematographers, the Steadicam Air is made of carbon fiber, which makes it lightweight and compact. Moreover, the monopod is marketed to nature, wildlife, sports, wedding, event and feature photographers as well as cinematographers. The Air is currently available in a 25-pound configuration. A 15-pound configuration is to follow in the second quarter of 2018. $499.95. In addition, the Steadicam M-1 is on display. The modular camera stabilizer is designed for HD broadcast, feature film and demanding camera-operating requirements. Fujifilm’s Optical Devices Division provides Fujinon 2/3″ HD and 4K UHD ENG, EFP and Studio zoom lenses for the videography, nature, television, broadcast sports and news markets. Fujifilm also offers cinema zoom lenses in PL mount (Premier and Cabrio) and E mount (MK) for cinematographers and cameramen in motion picture, television and commercial production. Featured at NAB 2018 is the Fujinon 4K Premier UA UA107x8.4, said to be the longest, widest 4K lens for Ultra HD broadcasting. 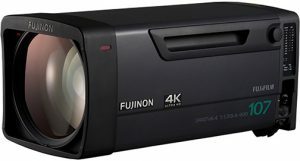 Built for 4K 2/3″ UHD cameras, it delivers 4K optical quality based on large-diameter aspherical elements designed by Fujifilm’s optical simulation system. It also suppresses distortion due to a multi-group zoom system. The UA107x8.4 employs Fujifilm’s High Transmittance Electron Beam Coating (HT-EBC) to produce richer colors and improved blue response and transmittance. Coupled with Fujifilm Aspheric technology, it reduces ghost/flare and increases light transmission. And its antifogging design minimizes fogging. Matthews Studio Equipment’s goal is to create camera and lighting support equipment that stands the test of time and also adapts to all types of shooting challenges. With this in mind, Matthews is debuting its K-Stackers II lighting support. K-Stackers mount three FreeStyle 31 LED panels or two 4×4-foot banks in a row. The LED controllers and 4Bank ballasts rig on the stand. Or also remotely up to 75 feet away via head extension cables. Users also can power the LEDs via 24V DC batteries mounted on the K-Stacker. In addition, the 4Bank fixtures rotate from a horizontal to a vertical light fixture mode. 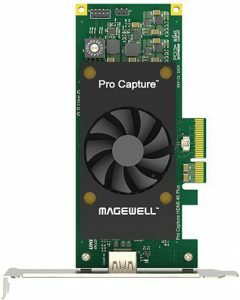 HDR (high dynamic range) support was added to select Magewell HDMI models in its flagship Pro Capture family of PCI Express capture cards. HDR enables more natural-looking, compelling video imagery, with enhanced contrast range. When viewed on HDR-equipped displays, it provides more detail in dark picture areas and brighter whites. It also displays an expanded range of mid-tones and more vibrant colors than earlier standards. When used with HDR-enabled video sources and software, Magewell’s HDR support lets users capture and record content compatible with the HDR10 open standard for TVs.